Union Square San Francisco is the United States' third-largest shopping area. The city's first mayor probably didn't imagine that would happen when he set Union Square aside as a public plaza in 1849. Neither did folks attending 1860s pro-Union Civil War rallies here. 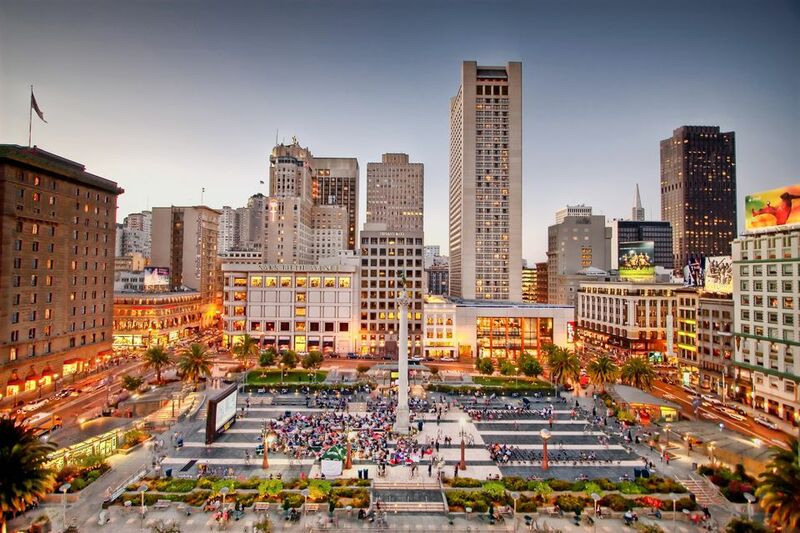 Nevertheless, Union Square became San Francisco's shopping epicenter in the early 1900s and today, upscale stores and hotels surround Union Square, and shopping extends blocks from the central plaza. Most Union Square shops feature clothing, artworks or items for the home. It's a nice place for browsing and window-shopping, but if you're going to buy anything, be prepared to open your wallet wide because prices are high. Stand in the middle of Union Square facing Macy's to get oriented. The Financial District and waterfront are on the left; in front of you (beyond Macy's) are SOMA (south of Market area) and the San Francisco Museum of Modern Art. Chinatown and North Beach are behind you, and the theatre/art gallery district lies on the right. In the Union Square plaza, across from the St. Francis Hotel, is the TIX half-price ticket booth. This outlet helps theatres fill unsold, same-day seats to plays and shows and it's a great way to see one without breaking your budget. For the best selection, get in line about 30 minutes before the half-price tickets go on sale. At the plaza's opposite end, you'll find Emporio Rulli, a good place for coffee and pastry or an afternoon snack. Sit at an outside table to enjoy people watching. Facing the plaza, Macy's Union Square, the biggest department store west of New York City, stretches from Powell to Stockton along Geary and spills into several nearby buildings. The elegant St. Francis Hotel occupies the Powell Street-side of Union Square. Don't just stand there looking at it, walk across the street, go in and take a look at the lobby. When you come out, you can start exploring the streets around the square. At Christmas, an ice skating rink sets up in the square. Maiden Lane is on the east side of the square on Stockton halfway between Geary and Post. For foot traffic only, it's lined with art galleries and restaurants. The V.C. Morris Gift Shop at 140 Maiden Lane is San Francisco's only Frank Lloyd Wright-designed building, considered a precursor to his design for New York's Guggenheim Museum. San Francisco City Guides offers free walking tours of the street and recants stories of the "professional" women who once lived in the area. Geary Street: On the west side of Union Square is the heart of San Francisco's theater district, with the American Conservatory Theatre and Curran Theaters at its center. Also on this street is Hotel Diva (440 Geary), a fun stop to see their "sidewalk of fame" covered with signatures of celebrity guests. At Stockton and Geary, Neiman Marcus forges a link to the past, built around the rotunda and magnificent stained-glass ceiling from the City of Paris, one of San Francisco's most important department stores, which stood on that same corner from 1850 to 1976. Just a half block down toward the waterfront from Market and Geary is one of San Francisco's most famous hotels, the Palace Hotel. It's worth a quick side trip to see their lovely lobby and Palm Court restaurant - and their Pied Piper bar is a nice place for an evening drink. Market Street: Near Powell Street and Market is San Francisco Shopping Center. Its spiral escalators worth a visit all by themselves. San Francisco is making progress in helping homeless people get off the street, but you may encounter them here. If you want to help, experts suggest donating to organizations instead of giving individuals money. Signs lead to Union Square from most area freeways. If you're using a GPS, enter 335 Powell Street, which is the address of the St. Francis Hotel. The convenient parking garage beneath Union Square is no more expensive than other city-run garages downtown. Enter on Geary across from Macy's. If its 985 spaces are full, circle Union Square making right turns until you're on Powell Street. Turn right on Bush Street off Powell, and you'll find the Sutter-Stockton Garage. Walking from North Beach or Chinatown, take Grant Street south through the Chinatown gate to Maiden Lane and turn right. San Francisco Muni bus lines 30 and 45 go to Union Square. At the nearby intersection of Powell and Market, you can catch the Powell-Mason and Powell-Hyde cable car lines, BART and the historic trolley car "F" line.